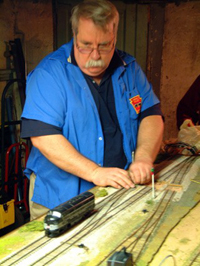 Anyone who resides in Eastern Pennsylvania and who is able to attend regular monthly meetings can request to become a regular member of the club. Being a regular club member entitle the member to all privileges including voting rights. The club meets once a month, usually on the third Sunday of the month, and rotate, in round robin fashion, among the various member's houses. 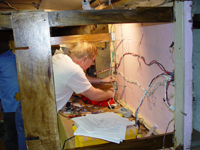 The club member who has the meeting is responsible for the meeting and the content can vary. Sometimes we help with layout construction, sometimes we visit other area layouts, and sometimes we just run trains and talk about them. We have two special meetings. In August, we have a family picnic at someplace with a railroad theme, such as at an operating tourist railroad or a museum. In December, we have a "Night on the Town" where we take our spouses out to a dinner theater. This is their reward for putting up with us the rest of the year. 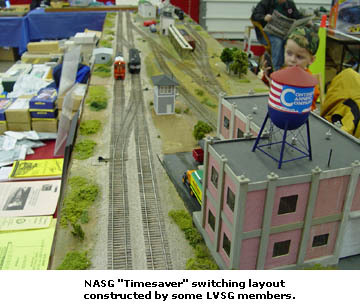 The LVSG supports the NASG and the NMRA and strives to have 100% membership participation in both.